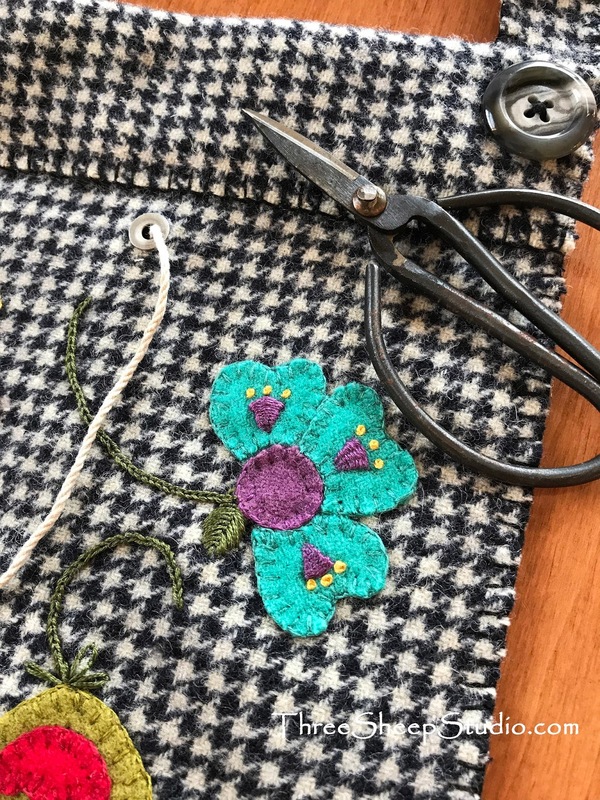 with colorful wool applique blossoms on the front. Measures approximately 8in. x 7.75in. I have a few of these at my house. ~ Secure herbs in a bag to flavor soups and stews. and simmer in a kettle of apple cider. ~Tie magazines and papers together for recycling. ~ Tie wool bundles together for hand dyeing. Ball of string is included. to see if you have won ! **A winner has been chosen and contacted. Wishing you a festive and fun weekend ! I will enter. I always love your work. I am happily working on that Santa. I hope to get it finished soon. My favorite cookie is Molasses Cookies. I make them over and over. Have a wonderful day. Very cute bag! I am finishing some embroidery of Santas. We love my mother's recipe for ginger crinkles. It is almost 50 degrees and very sunny here in Colorado so a little hard to be " in the mood" for baking. Just love the string Bag:). I love all your creations. My FAVORITE cookie is a Raisin filled cookie. My mother has been making them since I was a child. She is 94. What a cute (and useful) bag! My FAVORITE Christmas cookie.......oh there are so many......but if I had to pick one I think it would be 7 Layer Bars (or Magic Cookie Bars as some call them). Merry Christmas! I too am a big fan of your designs and this one I love also. My favorite is a little different - one that my mother made during the holidays. It's basically a brown sugar dough, rolled and cut in circles, then filled with a nut filling and folded in half to form half moons. The filling is milk and nuts and seasonings cooked until it forms a paste. Reminds me of simpler times when we had time to make such a thing. I always make anise Italian cookies for Christmas, even shipping some to the far away kids. Love your bag, such a useful pretty item. What a cute gift would love to win! My favorite cookie is anything frosted! I have way to many favorite cookies recipes but it has to be my Mom's Peanut butter cookies. I love the bag and everything you do. My favorite Christmas cookie is a fig cookie that my mother-in-law bakes. So good with a cup of hot coffee. I make a gingerbread boy cookie with a twelve inch cookie cutter. Then I have my kids help me decorate them. I love the bag! Today's favorite cookie is Bits of Brickle- a wonderful shortbread cookie with bits of toffee. The lovely lady who gave me the recipe was 103 years old at the time- and still making them! So cute, would love to win! My fave cookie is a Peanut Butter Blossom! Peanut butter cookie with a chocolate kiss on top, yummy! My all time favorite Christmas cookie is a date nut pinwheel...passed down from my mother. My mother in law loved them too but could not ever master them so I would make her a log to freeze so she could just slice and bake them whenever. Just an old fashioned sugar cookie with icing and sprinkles with a cup of hot chocolate. What a cute idea to keep string at hand in the kitchen! I make my great Aunt's old fashioned sugar cookie recipe with jelly inbetween and they have a small Christmas cutout in the top cookie. They take 11+ cups of flour to make one batch and take a good part of the day to make.....we do not give this family recipe to just anyone!! lol My mother has the original recipe in my great Aunt's handwriting in a frame in her kitchen...a wonderful Christmas tradition. MERRY CHRISTMAS! Almond butter cookies. I love the combination of houndstooth and bright flowers! Great idea for handy string. What a cute idea and your stitching is awesome as usual. My favorite Christmas cookie is the spritz my mom used to make. They were very pretty and tasted so good. We loved to decorate them with sprinkles and of course eating them was my favorite part! Merry Christmas to you. What a lovely string bag. My favorite Christmas cookie are Butter Balls. I make these every year (my mother's recipe) and share them with family and friends. What a lovely surprise. Thank you so much for sharing. My all time favourite christmas cookie is whipped shortbread. I love thumb prints rolled in mounds of nuts and raspberry jam....so good! Thank you so much for the chance to win!! Favorite Christmas cookies? Ice box cookies my mom made. Nothing fancy, just Mom's love. 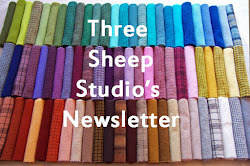 I'd love to have the wool bag -- it's delightful. I love the bag. It would make a perfect present for my sister. I think she would adore it. My favorite Christmas cookie from growing up would be what my mother called, "Russian Tea cookies". They are walnut cookies rolled in powdered sugar. My favorite Christmas cookies are the spritz ones my mom always made - some were dipped in chocolate and then in colored sprinkles. She baked dozens of different types, froze them, and then at Christmas everyone got to enjoy them and take home a tray. Thanks for the opportunity to share a happy Christmas memory. Thank you for the chance to win such a wonderful prize. My favorite Christmas cookie is a sugar cookie that my best friends mom made many years ago. They are not too sweet with a touch of nutmeg. Not a ton of frosting or sugar on top. I just love them. My daughter makes them for me now. Such a treat. Merry Christmas! This is a wonderful gift giveaway. Thank you for doing this. My favorite Christmas cookie is a large sugar cookie with thick vanilla icing that has been colored and sprinkles added while it is still moist. Such a treat!! Thank you for this wonderful opportunity to win this wonderful string bag. My favorite cookie is a cream cheese base cookie filled with apricot. A cup of tea with the cookies is a must! Merry Christmas to you and your family. 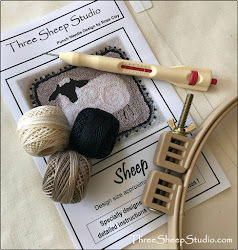 This is such a sweet bag and a terrific idea for holding the string! Thank you so much for the opportunity to win this! My all time favorite Christmas cookie is the peanut butter hershey kiss cookie! Love the bag! My favorite is peanut butter balls. Thanks for the giveway! Cutout sugar cookies with decorative frosting. It is fun seeing everyone's responses, and thank you for the giveaway. I enjoy your blog! My favorite Christmas cookies are Pizzelles! Any flavor! 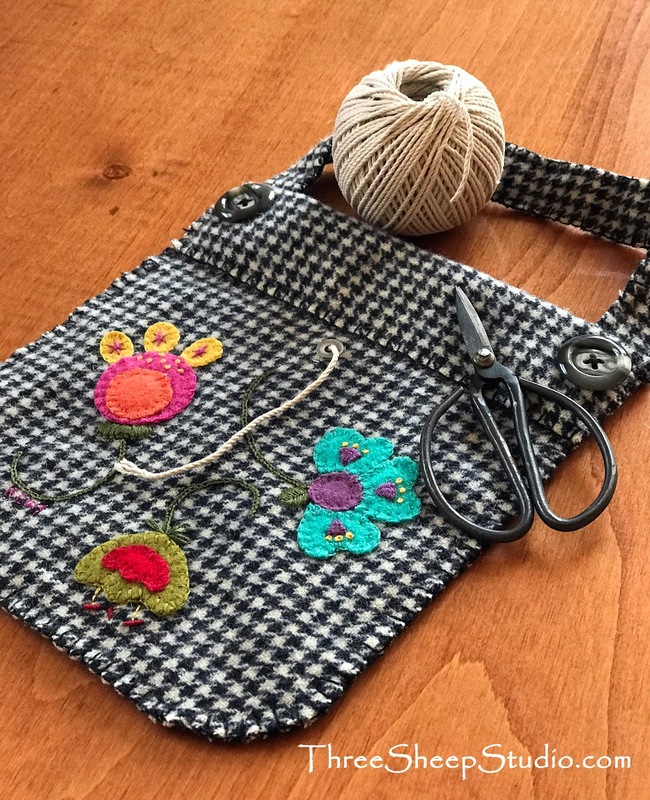 I love love love this string bag idea and appreciate the opportunity to win it :^} will there possibly be a pattern forth coming? lovely bag! jam thumbprints are my favorite cookie, Merry Christmas to you! My favorite Christmas cookie is the Hershey Kiss peanut butter cookie! And there is a "right" way to eat it: nibble all of the cookie away around the kiss and then eat that as your last bite! LOL Thanks for the chance to win...the bag is beautiful. Thanks also for your blog....I find it very creatively motivating!!! Melting moments. Addictive little morsels. So cute bag. I love russian wedding cakes. Melt in you mouth and look like little snow balls. The colors you used on the bag are wonderful. My favorite coolie is a homemade made, homemade! Sugar cookie. From mixing to rolling out to eating!! Always hoped Moms would bring to Christmas parties at school! By far, Date Skillet Cookies! It's now Christmas without them. My favorite cookie is a pizzelle cookie, my husbands grandmother made them every Christmas for him when he was a boy. He now carries on the tradition every year. My favorite cookie is called babes wrapped in swaddling clothes from an old Frugal Gourmet Christmas cookbook. Happy holidays! What a fun purse! I love your wool choices; it looks great. My favorite Christmas cookie is the traditional spritz cookies. I think it's tied to memories of when I was a young girl baking with my mother. I haven't been able to have spritz for years, as I can't have gluten, but I'm sure one of the wonderful GF bakers "out there" would have a good recipe for them. Hello Rose. No doubt about it ....sugar cookies in the shape of santa with extra thick icing put on by grandkids. They are the best. 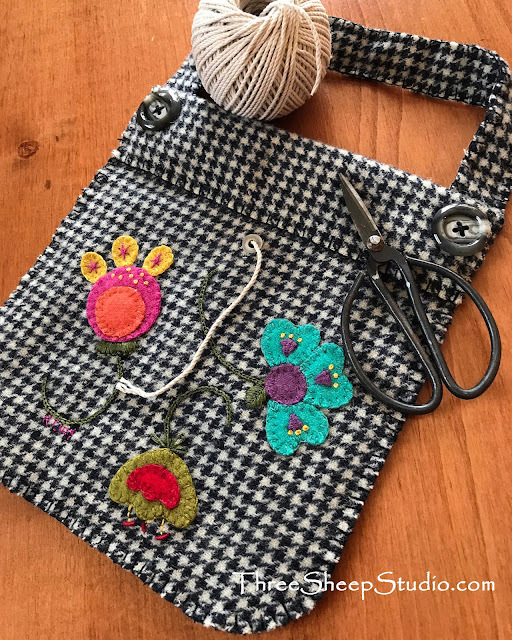 I look forward to new patterns from your shop and am busy working on the ones I've already bought but this one is really cute and what crafter can't use it? Happy holidays to you and the rest of your readers. I love reading your blog. It's soothing and always provides me with inspiration. My favorite Christmas cookie is my family's Italian Lemon Drops. LOVE these, as does my daughter!. This bag is really cute, by the way. Roseanne above is right; it's very cute. I still have to make my mother's Russian teacakes. Merry Christmas! 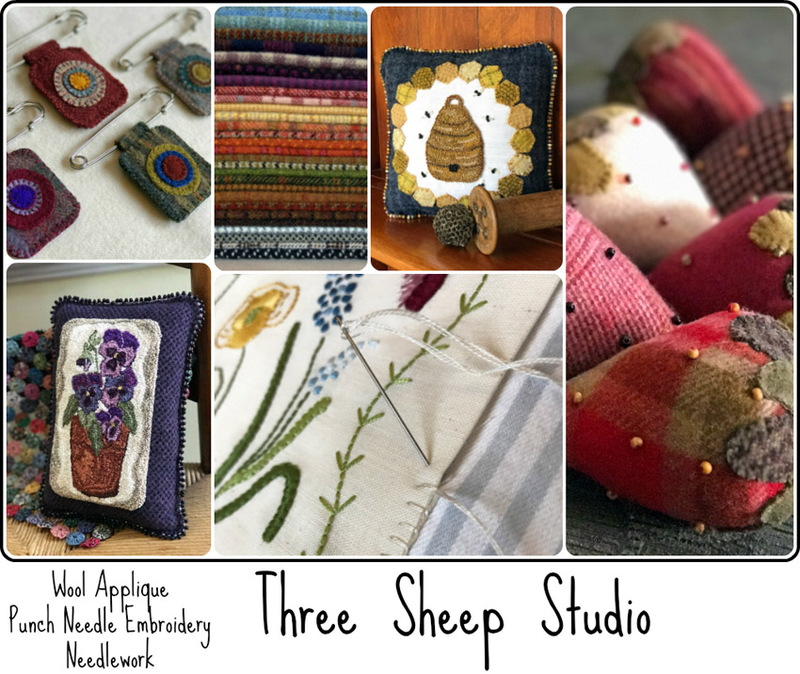 Love your work and I love working with wool. This is a clever and lovely way to have string available in your kitchen..or sewing room, or garage...or wherever. Thanks for the idea, and I hope I win!